Loads of photos claiming to show the Samsung Galaxy Note 7 have leaked over the last couple of months, but for the most part they've all been focused on the front of the phone. As such we've had a good look at the screen and iris scanner, but not at the back, the camera or the ports. Well today that's all changed, as a new batch of photos has been posted to Weibo and spotted by TechTastic, giving us a clear look at the front, back and bottom edge of the Note 7. 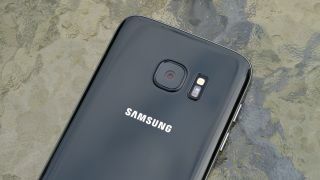 From the back it looks a lot like the Samsung Galaxy S7, with a reflective black covering that's likely made of glass and a camera that looks exactly the same, complete with a lens that appears to protrude slightly from the back. While the same design doesn't mean the same specs, it suggests there probably isn't going to be a huge change to the snapper, which on the S7 is 12MP with optical image stabilization and indeed most current camera rumors point to a 12MP unit. The back is otherwise plain and lacks the Samsung logo found there on the Galaxy S7 and Galaxy S7 Edge, but then the handset is likely a prototype rather than a finished version. At the bottom edge the design is again a lot like the Galaxy S7 range, with a 3.5mm headphone port and a speaker. However, there are two key differences. First, the USB port appears to be USB-C rather than micro USB. That's not the first we've heard of Samsung making the switch, so it's believable. The other difference is the slot on the right for the S Pen. We don't get a good look at the pen itself here, but it leaked just yesterday, and looks similar to the Galaxy Note 5's. There's less to say about the front, as we've seen it so often, but the screen appears to be flat here, which further suggests this is just a prototype, albeit a functional one, as we're not expecting to see a flat version of the Note 7. Then again, this is the second flat-screen version we've seen leaked in as many days, so it's always possible that Samsung will surprise us with both flat and curved models. We'll know soon, as the Galaxy Note 7 is almost certainly going to be unveiled on August 2, which is now less than two weeks away.